The annual Army-Navy football game is one of the few opportunities for civilian types to have a front row seat to military culture. War News Radio’s Amy DiPierro went to this year’s match-up expecting to find soldiers playing air guitar on their M16s and cadets doing one-armed pushups on the sidelines. Instead, she found the warm and fuzzy side of military pageantry. AMY DIPIERRO: In the same way that illness is not metaphor – war is not metaphor. Love is not a battlefield, you don’t need to fight for your right to party, and – contrary to popular belief – there is no war on Christmas. So the annual Army-Navy football game is not a war. After all, in war you don’t have cheerleaders, or mascots, or glee clubs. And you certainly don’t have Linda Souza enjoying the rising talent on display. AD: The Army-Navy football game isn’t a war; it’s a pageant. It’s an annual stage for the academies to prove their mottos: for the Navy to wring “Sea Power” from Knowledge, and for the Army to put its “Duty, Honor, and Country” under the spotlight. The cynical part of me thinks it’s also a public relations coup – if you’ll excuse the war metaphor – distracting from two lingering wars Iraq and Afghanistan and the possibility of a third in Syria. But that would be denying the experience of the true believers: the players, cadets, midshipmen, friends, family, and fans who make up this pageant’s extensive cast and crew. Why can’t the military just have its football game without some pesky journalist seeing it as a cover-up? Why can’t Souza just watch the gorgeous young men play ball? AD: But first, the interview portion of the competition. I asked every contestant the same thing: what does this game mean to you? LINDA SOUZA: With so much polarization in the U.S. right now, it’s really encouraging, and heartening, to see everybody getting together to have a good time. WOMAN: Well, this makes you so proud to be an American. It doesn’t matter whether you’re for the Army or for the Navy – you’re for the United States. AD: Then again, this isn’t Miss America. For the talent competition, the military still brings out the big guns for the big game. Each academy has a squad ready to fire a round at the end of the national anthem, touchdowns, and each quarter. AD: Cadet Ryan Herrmann is the battery commander for the West Point cannon crew. RYAN HERRMANN: The Honey Badger crew just took great care of their gun, so it was the best-looking gun, best gun on the line. AD: Meanwhile, the Navy cannoneers have a full brass cannon with a big Navy seal on it. Midshipmen First Class Caitlyn Fine says her hardware is part of a fine Navy legacy. CAITLYN FINE: I think ours better represents the tradition of the Navy, because it’s the shiny cannons that used to be on ships. AD: For other contestants, the talent contest got a bit…hairy. Midshipmen First Class Matthew Kelly is one caretaker of the Naval Academy’s hooved mascot, a live goat named Bill. He told me Bill is an intimidating presence on the field. MATTHEW KELLY: It strikes fear into our opponents when we play them, and I think it boosts the morale. 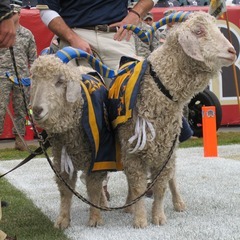 AD: There are two Bill the Goats, actually, both of which are present for today’s game. Even a formidable mascot needs a brother in arms. MATTHEW KELLY: They travel a lot better when they’re in pairs. They live together, like, all year, so it would be tough for them to separate them. And they don’t work well when they’re separated. AD: Then again, life with Bill isn’t all friendship and glamor. The dirtier jobs of pageantry go on almost unnoticed behind the scenes, when Midshipman Kelly and other caretakers discretely maneuver the stubborn goats into the stadium and clean up their poop. But for the rival team’s mascot, even poop-scooping is part of the show today. MICHAEL NATHMAN: My name is Cadet Michael Nathman and I’m a freshman at the United States Military Academy. I’m a freshman mule rider on the team, so my normal job is to pick up the poop. AD: Today, Cadet Nathman is using a shovel with a Navy N for the occasion. The tub where he deposits the mule manure reads “Navy Think Tank” in vibrant yellow on a royal blue background. MICHAEL NATHMAN: This is limited edition, We got this just to do the Army-Navy game. AD: But let’s not forget the Evening Wear portion. Who looks better: the cannoneers or the gunners? It seemed to be a question of style versus function. Midshipmen Fine and her colleague, Midshipmen Second Class Logan Wilk defend their Naval gear. CAITLYN FINE: Our uniforms are way cooler. LOGAN WILK: They’re just wearing boring uniforms. We have swords and we look like pirates. AD: Cadet Herrmann isn’t convinced piracy is a good look. RYAN HERRMANN: “Their uniforms…they look like the Barbary pirates, so they can have that one. I mean, we’re in the actual army uniform, the uniform that guys across the entire globe are wearing, in Afghanistan right now. I think our uniform has a bit more purpose to it. AD: Then, there were the fan costumes. Remember Linda Souza, who was out to see the gorgeous young men of the academies? She was all gussied up, too. LINDA SOUZA: I’m wearing a handmade sweater in the West Point colors that has knitted into it, on the front, “Go army” and on the back, “Beat Navy” with the Army A, and I’ve adapted woolen donkey hats, the symbol for the army is the army mule, and I found donkey hats and took out the pink insides of the ears and made them gold and put the pigtails on the side in the West Point colors. AD: As in all pageants, there were winners and losers. In the fourth quarter, I recognized General Ray Odierno – current Chief of Staff of the Army and a graduate of West Point – pacing up and down the Army side of the field. Here was my chance to ask him a tough question – maybe something about the wars in Iraq or Afghanistan, or the first Army-Navy football game since Don’t Ask Don’t Tell was repealed. At the least, maybe I could get his reaction to the game. Army was leading 13-10 when Navy scored. AD: General Odierno looked crushed. Suddenly, it didn’t seem like the time or place for questions about war. Here was a man who had just experienced a very personal loss. Football may not be war, I thought, but it still has its casualties. I decided to pay my respects and keep my distance. Besides, he was surrounded by a Secret Service detail. For War News Radio, I’m Amy DiPierro. Asking questions are genuinely good thing if you are not understanding anything completely, however this post offers pleasant understanding even.